Sometimes when you’re thinking about the love of your life, a stroke of genius hits you! That’s exactly what happened when I was thinking about my dh a few weeks ago. The man loves banana pudding and I hate it! But I loooovveee cake! Suddenly I heard harps playing, as I sometimes do, and ding ding ding! What if we put the two together! So I started to research what banana pudding recipe to use (again, I don’t like the stuff, so I had no clue what should go into it). It was then that I realized there was a better way of making it than what I was thinking. 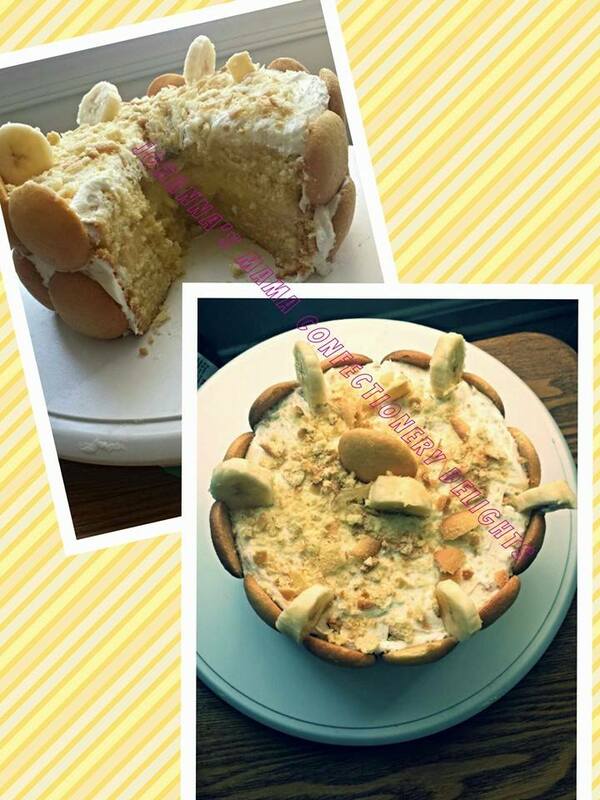 I was simply going to make a white cake with banana pudding and vanilla wafer filling. But then I saw that someone else actually put banana pudding into the cake as well. Genius! And ever since I posted that cake on my fb and instagram pages, folks have been asking me for the recipe. So here it is! I’m going to warn you right now that it’s quite a few steps, but if you love to bake, or you just adore who you’re baking for, it’s not a problem! Preheat oven to 350 F. Prep three 8″ round pans (or 2 pans and 1 cupcake pan) by lining the bottom with parchment paper or baking spray. Cream butter and sugar until light and fluffy. Slowly beat in eggs and egg whites, one at a time. Beat in vanilla until well combined. In a separate bowl, combine flour, baking powder, and pudding mix. Add into wet ingredients in three separate additions, mixing until just combined. Don’t over mix! Stir in milk until combined. Divide batter and pour into 3 pans. Bake 22-25 minutes or until cake is golden and begins to pull away from sides of pans. Allow cake to cool 15 minutes in pan. Loosen and remove from pan. Allow to cool another 1-2 hours on a wire rack. Mix together sugar and cornstarch and slowly add milk. This should be cooked in the top of a double boiler, but you can cook it over low to medium heat, stirring constantly until it thickens. Do not leave it unattended. Slightly beat egg yolks and temper with a small amount of the hot custard; stir well. Add egg mixture to custard pot and cook 2 more minutes. Remove from heat and add vanilla and butter. Let cool. Level each cake. Add the pudding and slices of banana between the cakes to make a 3 layer cake. Brush outside of cake with milk mixture. Decorate with leftover slices of bananas. Cover the whole cake with whipped cream frosting and top with nila wafers. Refrigerate until ready to serve. Stopping in from SITS Sharefest and hope you’re enjoying your weekend! Yes, because I’m a fatty and he can’t have something yummy unless i can too lol! Thanks for stopping by. Please come back again!